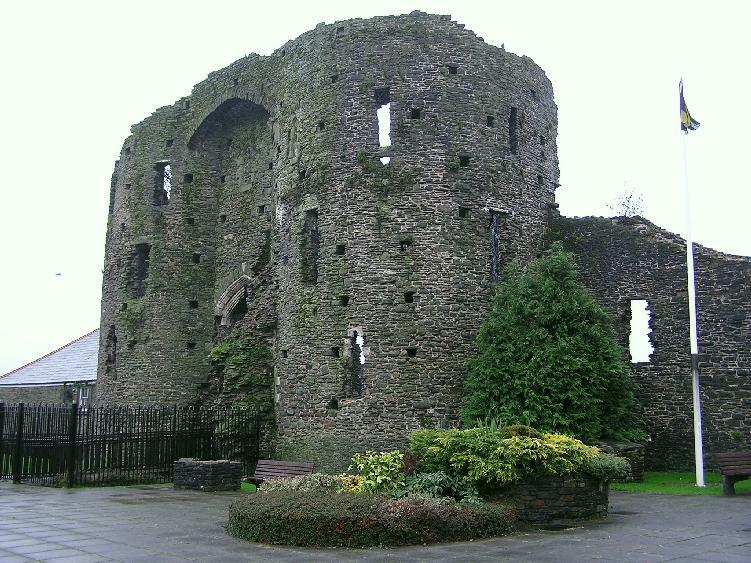 Neath Castle was one of the minor Norman castles in the lordship of Glamorgan. Like the Romans before them, the Normans chose this strategic spot guarding the river crossing for a stronghold. The main surviving feature of the castle is the great twin-towered gatehouse on its west side. This belongs to the latest phase in its 250 year history. The first castle was a ringwork known to have been built here in the 12th century by Robert, earl of Gloucester. The roughly oval, raised enclosure to the east of the gatehouse probably dates from this period. The castle was much harried by the Welsh, and was rebuilt sometime in the early 13th century, possibly after being destroyed by Llywelyn ap Iorwerth in 1231. The ruined curtain wall is part of this castle, although it has been much tampered with since. It had two projecting round towers, the stump of one of which is visible to the east side. There was a simple gatehouse on the site of the present one, and the flight of steps well below present ground level in front of the present gatehouse led up to this 13th-century one. The castle was again severely damaged by enemies of the unpopular lord of Glamorgan, Hugh Despenser. It was the 14th-century rebuilding after this attack that gave it its magnificent gatehouse. Only the fronts of the great D-shaped towers and the arch between them survive. The steps of the old gateway, now uncovered again, were buried and a drawbridge used instead. Jutting out from the front of the right-hand tower is the broken end of the town wall. The interior of the castle can be glimpsed through a gateway on the south side, but foundations of buildings ranged around the curtain wall are all that can be seen.